ASK any parent what it is like to drag their child to the shops and they will tell you it can be quite the adventure to say the least. But when your child has autism that adventure can quickly turn into a nightmare. 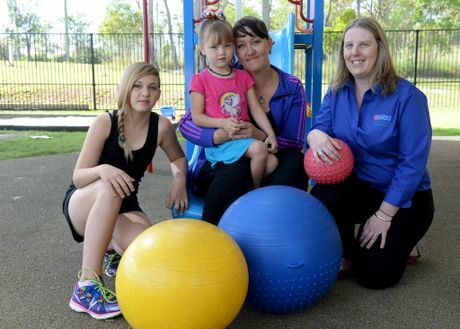 Bundaberg mum Bek Weller has several children with autism, with her youngest child, Kaaliya-Dae, diagnosed two years ago. "Kaaliya was diagnosed when she was two, but we knew before then because all the signs were there," she said. Autism is a lifelong developmental disorder and, for a person with autism, life can be a confusing mix of people, places, sounds and sights. Ms Weller said raising children with autism was challenging enough without the stigma associated with it. "People think if the kids are struggling, because those social situations are very stimulating for them, that it is okay for them to sit there and criticise your parenting," she said. "Unless we put them in that situation, they will never learn how to overcome it." While there is no cure for autism, early intervention can help children develop communication, academic and self-help skills. Ms Weller said because of the dedicated staff at the Bundaberg AEIOU Early Intervention Centre, Kaaliya's life had changed dramatically. "When you do private therapy, maybe you go for an hour session once a week," she said. "Whereas when they get 26 hours of therapy a week, it allows you to be your child's parent and not their therapist. "Kaaliya is really the poster child for early intervention." Centre manager Andrea Trudeau? said the aim of the centre was to equip parents and children with the necessary skills to deal with an autism diagnosis. "We try set up a lot of things that families can follow through with at home and into their communities," she said. "We have a really strong team here." Later this month, AEIOU Foundation is hosting the inaugural Take a Hike Wide Bay challenge, a nine-hour 40km walk to raise money for autism. It hopes to raise up to $50,000 for AEIOU early intervention centres in the region.